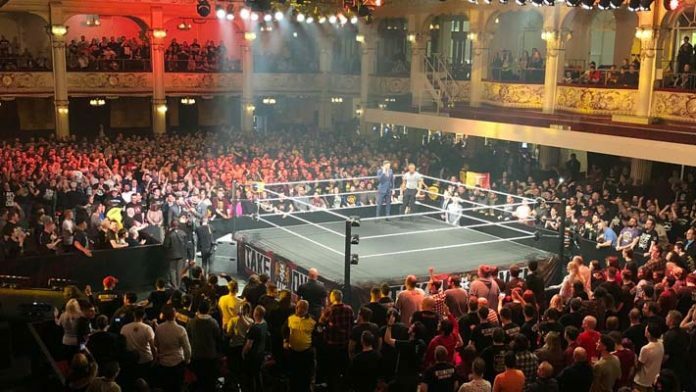 The journey of bringing the WWE NXT UK brand to the more fans has continued as the company held TV tapings on Friday from the Coventry, England at the Planet Ice Coventry. – Isla Dawn defeats Killer Kelly. – Ligero defeats Joseph Conners. Post-match, Conners rejects a handshake. – Mike Hitchman & Primate defeat Sam Stoke and his partner. – Nina Samuels defeats Charlie Morgan. – Jordan Devlin defeats Travis Banks in a falls count anywhere bout. – Wolfgang defeats Flash Morgan. – Kenny Williams and Amir Jordan defeat Saxon Huxley and Tyson T Bone. – Noam Dar walks out to the ring where he cuts a promo about he’s now full-time in NXT UK and calls out Mark Andrews. They brawl. – Kay Lee Ray debuts and defeats Candy Floss. – Eddie Dennis defeats Ligero. – Moustache Mountain cut a promo in the ring about how they’ll be competing at tomorrow’s taping. – Fabian Aichner and Marcel Barthel defeat Howley and Stoker. – Kassius Ohno defeats Ashton Smith. Post-match, he continues to attack after until Travis Banks makes the save. – Pete Dunne and WALTER defeat Joe and Mark Coffey in the main event. WALTER and Dunne stare each other down afterwards.